Homemade Grapes Wine made from grapes. Homemade Grapes Wine is easy to make. Homemade Grapes Wine, making homemade wine from fruit is simple, enjoyable, and worth every last sip. 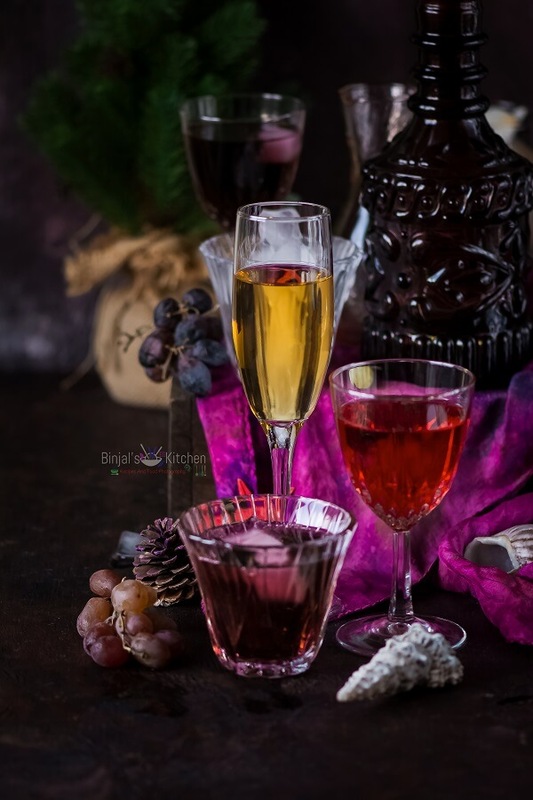 Homemade Grapes Wine is a colorful and tasty addition to any wine rack, fruit wines also make fantastic culinary ingredients for sauces, marinades, salad dressings, and even some desserts. Normally I make basic wine before New year, whatever grapes available in the market. 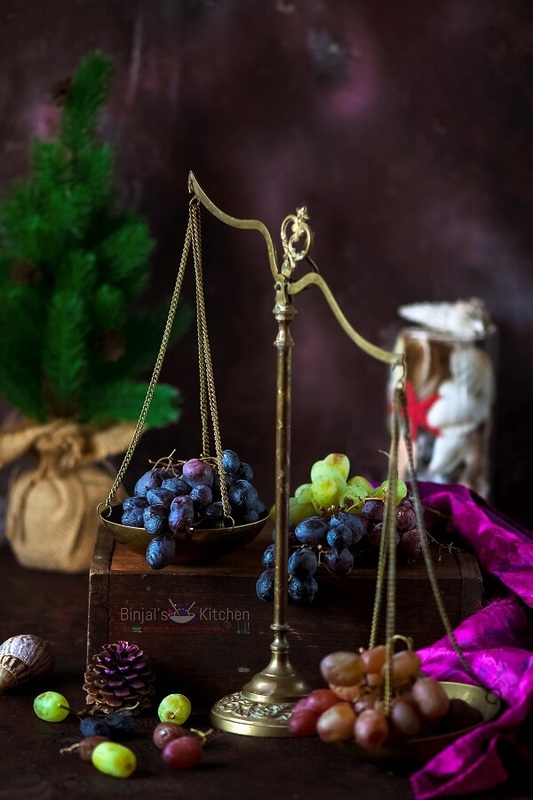 But this time when I saw three different color grapes in the market so decided to make three different wines with slightly different flavor adding some fruit/juice. And you won’t believe it is so perfect. 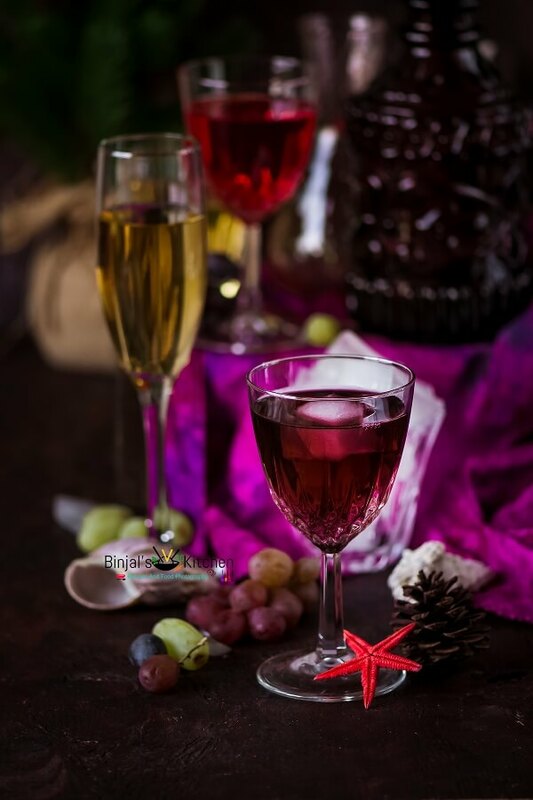 There are plenty of homemade wine recipes available, but if you want a really easy wine recipe that tastes great and doesn’t take long to make, then the first homemade red wine recipe below is excellent for cooking and for drinking. I know I’m late to post this recipe for this Christmas or new year, but you can bookmark or make this for coming celebration like valentine and give the surprise to your loved ones or your friends. 2. In a big gallon (air lock container available online) add sugar and 1-2 cups water and stir it till dissolved. Add cloves, mashed grapes and mix it, then sprinkle the yeast over it. 3. Do not stir the mixture after adding the yeast at least 24 hrs, cover the cap and keep aside. 4. After 24 hr, stir the mixture every day for a week. 5. Strain the mixture using a muslin cloth, add into the clean gallon (air lock container), fill with additional water, and lets the ferment about 5-6 weeks. 6. Strain off again and bottle it or store it in a clean gallon container. Cap lightly for 3 days to allow for any more fermentation to cease. Cap it and store in a cool place. • The above recipe is a basic recipe of Wine! I bought three different colors of grapes to make 3 different colored Wine. 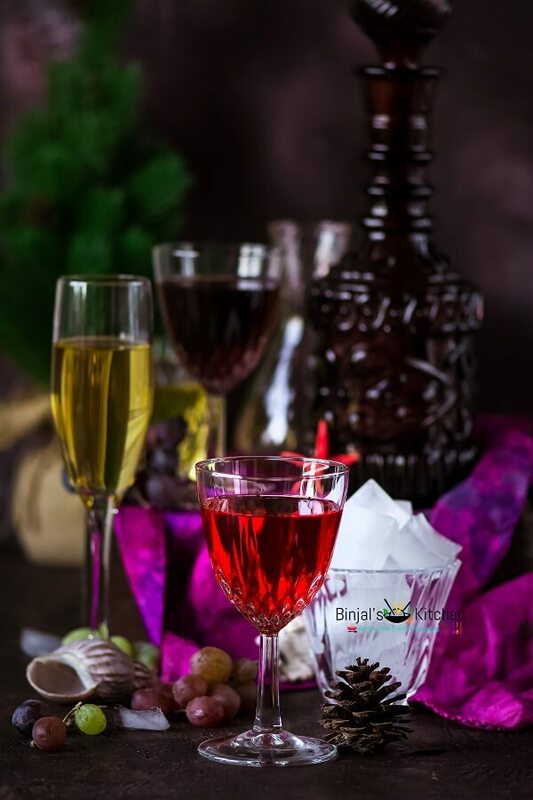 • For red Wine I used red grapes with ¼ cup of Beetroot Juice. • For Dark Purple/Blue wine I used dark black Grapes with ½ cup of Blueberries. 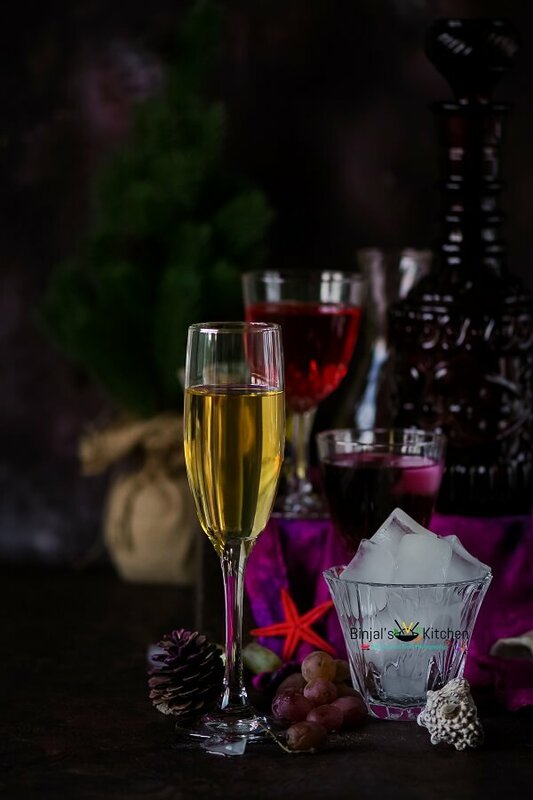 • For yellow wine I used yellow and green grapes with ½ cup of apple juice. • You can buy wine kit online or simply use any big gallon size bottle or use milk gallon. • If you are using regular gallon then use this instruction: – Poke a hole in the cap of the gallon and place one end of the plastic tube (pipe) into it. Run the other end of the plastic tube into a glass of water. This allows the carbon dioxide to escape so your fermenting wine won’t explode, but it also stops the air getting back into your wine. • For best result use overripe grapes. In a big gallon (air lock container available online) add sugar and 1-2 cups water and stir it till dissolved. Add cloves, mashed grapes and mix it, then sprinkle the yeast over it. Do not stir the mixture after adding the yeast at least 24 hrs, cover the cap and keep aside. After 24 hr, stir the mixture every day for a week. Strain the mixture using a muslin cloth, add into the clean gallon (air lock container), fill with additional water, and lets the ferment about 5-6 weeks. Strain off again and bottle it or store it in a clean gallon container. Cap lightly for 3 days to allow for any more fermentation to cease. Cap it and store in a cool place. • If you are using regular gallon then use this instruction: - Poke a hole in the cap of the gallon and place one end of the plastic tube (pipe) into it. Run the other end of the plastic tube into a glass of water. This allows the carbon dioxide to escape so your fermenting wine won’t explode, but it also stops the air getting back into your wine.